Northern Tablelands MP Adam Marshall, left, GLENRAC Project Co-ordinator Jennie Coldham and GLENRAC board members Tony Corcoran and Ian Trow celebrating the funding news. NORTHERN Tablelands MP Adam Marshall says a $99,330 NSW Government grant to a Glen Innes land conservation and management group will see some 19,000 native trees and shrubs planted across the district in the next 12 months. 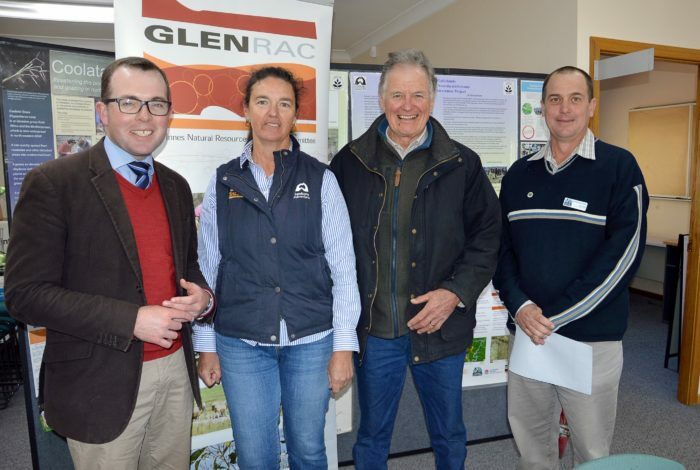 Mr Marshall today announced the funding for the Glen Innes Natural Resources Advisory Committee (GLENRAC) to restore biodiversity and on-farm habitat on 12 different farming properties around Glen Innes. He said GLENRAC would manage the project while the landowners would be involved in ground preparation and ongoing control. Project manager Jennie Coldham said local disability services and support organisation Glen Industries would also help with the plantings of the seedlings while the fencing, weed control and ground coordination and management, would be the responsibility of the individual landholders. “They are all grazing properties and mostly larger properties and the numbers of natives we’ll be planning ranges from 400 to 2,000 plants per property,” Miss Coldham said. Mr Marshall said the 19,000 plants were a mix of eucalypt, acacias and bottlebrushes, depending on where the sites were. “Some of those sites are in Ben Lomond and are different to those in Deepwater, so that will determine the nature of the natives to be planted,” Mr Marshall said. “This is a real boost to local environmental restoration and will increase the amount of available native habitat across the Glen Innes district. Miss Coldham said they were aiming to plant in Spring next year but the land conservation group was encouraging landholders to start their ground preparation now, or when it rains. The project has identified 35 sites on those 12 properties for the plantings and includes species from two threatened ecological communities, namely New England peppermint grassy woodlands and white box, yellow box and Blakely’s red gum grassy woodlands. Mr Marshall said the funding came via the NSW Environmental Trust’s Restoration and Rehabilitation Grant Program and the Glenrac project fitted with the aim of that program to protect, restore and enhance the local environment. He said the plantings would result in significant environmental benefits for the local community. GLENRAC is one of 46 community groups and government entities across NSW successful in sharing the funding pool under this year’s program. It was formed in 1989 by a group of people interested in land management and land conservation issues and says its vision today is to provide solutions for a sustainable and productive landscape while initiating and coordinating action for landholders and the community to manage and maintain the natural resource base of the region. Miss Coldham welcomed the funding, saying GLENRAC would not have the capacity to undertake projects like this one without such landcare initiatives provided by the State Government.